The OASE Pondovac 3 removes organic and dirt particles up to 3/8" in diameter. The Pondovac 3 features a debris collection bag to capture debris as it is discharged from the vacuum. 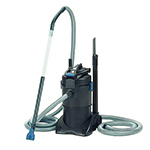 Sturdy, built-in wheels and an adjustable handle allow for easy vacuum placement and movement. Maximum suction depth of 7 ft.